Slight correction, the Adnams bitter is on keg not draft. Also they've got rid of the marquee you can see in the photo, so if it's raining there's nowhere to sit outside (which matters to me as I'm usually with the dog). Been here a couple of times since it reopened and it's pleasant enough sitting in the sunshine but I'm glad I've never tried to eat here as the staff don't seem to have slightest idea what they are doing. This used to be a decent , if a small bit tatty in later years, traditional country pub. But last summer it underwent a major refurbishment which turned it into a Gastro restaurant and any pretence of it being a country pub disappeared. Internally it is completely laid to dining tables , which have to be booked in advance usually, and there is no longer any area for just drinking. I've eaten here once , and although the quality was fine the quantity was insultingly pretentious for what you had to pay and I certainly won't be rushing back. Externally there is a smart terrace area to the front and gardens and large terraced area to the back by the car park. The Hoops is probably OK for an outside beer when the sun is shining and it offers a limited selection of beers including Guinness and Bitburger, and draught cider, and there is a solitary hand pump which dispenses Adnams bitter. OK if you want to splash the cash and treat someone who doesn't have a big appetite, but if you are visiting the Henry Moore Foundation and you just want a pint and a sandwich, then I am afraid it is back in the car for a short drive to one of the many superior traditional pubs in the surrounding villages. Now refurbished very nicely inside, but very much a place to eat rather than to pop in for a pint or two. The food is pretty good to be fair (although not top notch) but only one proper beer on - Adnams bitter. Had a very good meal at the newly opened and refurbished Hoops Inn. Slow service but a relaxed, friendly atmosphere. 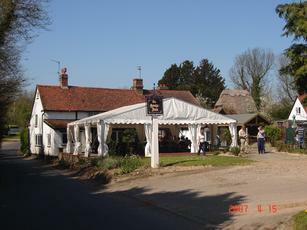 Pleasant country pub situated next to the Henry Moore sculpture park. Large outside seating area part of which is under a marquee. More interested in food than beer but still normally has at least 2 real ales available, kept well but make sure they top up your glass! If you want to eat here it's advisable to book at the weekends as can get very busy.